Heritage Bank Plc has registered its presence in Ogijoin the Sagamu Local Government Area of Ogun State; with the commissioning of Dunmop Ventures as agent banking partner under the financial inclusion policy of the Central Bank of Nigeria (CBN) which is designed to bring banking services to the under-banked in Nigeria. The bank recently inaugurated the corner shop as its agent banking partner to carry out agent banking transactions on beside the 74th Battalion of the Nigerian Army and PZ manufacturing outfit along the Shagamu Road in Ikorodu area of Lagos State to provide agency banking services for its customers that live in the area. The agent bank will handle account opening, cash deposit, funds transfer; cash withdrawal and bills payment among others. 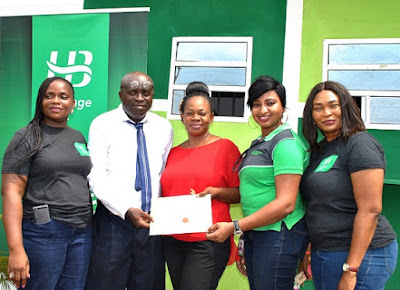 Mrs. Oluwakemi Adewunmi, who is in charge of agent banking in South West and South-South for the bank, at the opening ceremony said the bank has signed on more than 500 agents since it commenced the programme about two years ago. She noted that the bank was using the agency banking system to bring banking services to the door steps of the rural communities in the country. According to her, based on the market survey Heritage Bank carried out on the neighbourhood, the people living in the community used to travel over a distance of a minimum of 7km before reaching the nearest bank in Ikorodu anytime they needed to do banking transaction. Again, she added that financial transactions could now be carried out seven days a week without regard to weekends and public holidays. Adewunmi explained that customers can open bank accounts, deposit cash, transfer money even to other banks and also pay bills. Managing Director of Dunmop Ventures, Mr. Kale Adekitan said they were very happy to be appointed as an agent of Heritage Bank, adding that they felt they should make contribution to the growth and development of the community which lacked banking facilities as residents had to travel to Ikorodu or Ogijo to be able to have access to banking facilities. He said they had created enough awareness among the residents and the military community as well as community leaders and the responses had been very encouraging. Some soldiers and residents who spoke on condition of anonymity said they were very happy for the opening of the agent banking facility in the community. The agency banking policy was sequel to a research conducted by an international agency, Enhancing Financial Innovation & Access (EFINA) in 2008 which showed that about 74 percent of Nigeria’s rural community was un-banked. Against this backdrop, the CBN therefore initiated the policy with the aim of reducing the figure by 20 percent by 2020 to ensure greater participation in the nation’s financial sector.